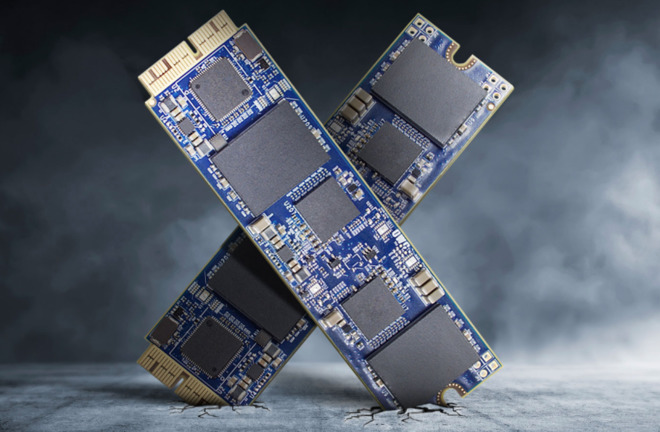 Mac upgrade supplier OWC has released its newest SSDs, the Aura Pro X, with the flash-based PCIe storage said to be the fastest the firm has ever produced, claimed to offer up to 2.3 times better performance compared to the stock storage used by Apple. The Aura Pro X series is built around an advanced NVME controller combined with 3D MLC NAND flash memory, which allows for read and write speeds of up to 1352 megabytes per second and 1066 megabytes per second respectively. According to the product pages, these speeds are identical across the range, regardless of its capacity. The drives are designed to support technologies used in macOS 10.13 High Sierra, including advanced features in APFS, such as strong encryption, space sharing, file and directory cloning, copy-on-write metadata, fast directory sizing, snapshots, and improved file system fundamentals. A more efficient power management system is also included, to help increase the host MacBook's battery life. The Aura SSDs provide three layers of error correction and a global wear-leveling algorithm to extend the SSD's life. OWC also overprovisions the drives by 7 percent, permanently allocated as free space and used by the SSD to perform maintenance tasks in the background to optimize performance and overall drive health. OWC claims to have engineered the flash storage specifically for Mac, so users can install the hardware without requiring any complicated changes to the operating system or TRIM-enablers. To simplify the installation process further, OWC offers an upgrade kit alongside the SSD blade, which includes the tools required to open up the Mac or MacBook, a USB 3.1 Gen 1 Type-A to Micro-B cable, a user guide, the OWC Envoy Pro enclosure, and a carrying case for the enclosure. The Envoy Pro enclosure can be used to house the factory-installed SSD, effectively turning it into a USB external drive. Backed by a five-year limited warranty, the range consists of four drive capacities: 240 gigabytes, 480 gigabytes, 1 terabyte, and 2 terabytes, though the last model is expected to ship in mid-November 2017. The blade-only versions cost $279.99, $419.99, $649.99, and $1,279.99 respectively, depending on capacity. Two different kits can be acquired for the three available capacities at a higher cost, providing instruction and tools for select 2013 and later MacBook Air and MacBook Pro models, as well as the Late 2013 Mac Pro. 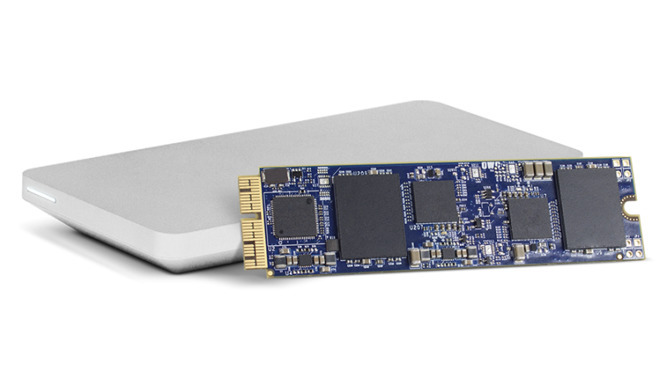 OWC advises the Aura Pro X SSDs support the Mid 2013 and later MacBook Air, the Retina and Late 2013 to Mid 2015 MacBook Pro, the late 2014 Mac mini, the Late 2013 and later iMac, and the Late 2013 Mac Pro.